Outdoor Reset Modulating Boiler Control. The Mini-Mod is an outdoor reset modulating boiler control. It is the perfect control whenever multiple fully modulating hot water boilers are used in building heating applications. The Mini-Mod controls the on/off and the modulation of each stage to maintain precise set point control using PID type control logic. Controls 0-5 V, 0-10 V, 1-5 V, 2-10 V, or 4-20 mA modulating motors. The Mini-Mod is the perfect modulating boiler control as it is designed to accurately modulate the output from 0 to 100% of modulation for each of these different types of boilers / motors. One Mini-Mod can even control any combination of the above types of motors. Digital Display of all System Settings. The Mini-Mod’s graphical display names each system parameter in plain English and shows its precise value. The easy to follow menu system allows user to quickly make changes to any system setting without having to learn any specialized codes or keyboard commands. Protection is available to prevent unauthorized users from making adjustments to control settings using an enclosed switch that can be locked. The Mini-MOD has a variety of boiler Rotation options. Thus, offer muliple way to rotate the boilers to promote even wear on each boiler. The Mini-Mod has three modes of rotation : Manual, Last-On, or automatically every selected time period from every hour to every 60 days in one hour increments. The Mini-Mod can be connected to existing or new Heat-Timer outdoor reset controls (HWR Platinum for hot water heat). The Mini-Mod also has built in hot water reset with adjustable reset ratios, offset, outdoor cutoff, minimum and maximum water temperature. Temperature Set Point or EMS Option. The Mini-MOD canbe set to modulate boilers to achieve a fixed set point. 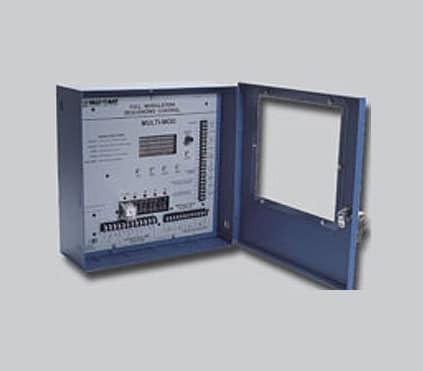 Moreover, using the 4-20mA EMS Interface, it can accept a set point from an EMS system. An advanced PID logic has been developed to provide an efficient, smooth, and adjustable modulation that can fit most applications whether the boilers are to sequence normally, one after the other, or in parallel. With numerous configurable parameters like; Last Stage Hold and Soft-Off to eliminate the lead boiler short cycling; Lag Delay to eliminate lag boilers short cycling. The PID logic can be adjusted to meet your specific heating application. 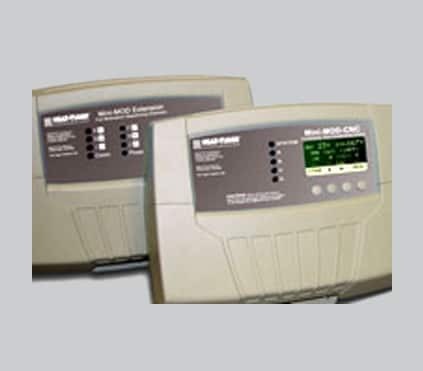 Connects to Energy Management Systems. All Mini-Mods can be disabled by an Energy Management System(EMS) or other controller when there is no output requirement. Moreover, using the 4-20mA EMS Interface, the Mini-MOD can accept a set point from an EMS system. Day and Night Schedule or Setback. The control has an adjustable Night Setback setting to help reduce fuel consumption. The built-in schedule can be used to customize the operation for even further temperature control and fuel savings. Furthermore, the Mini-Mod provides an alternative Setback option for applications that rely on other equipment and controls. System Output is Active with Stages with an Adjustable Delay. This output can be used to activate a system pump, combustion air damper, or perform any other function that is required when any stage is active. A System Prove input checks the status of components activated by the System output before stages can be activated. An adjustable delay is available to disburse additional heat in boilers. It can be configured with Domestic Hot Water call option. It will increase system water temperature when Domestic Hot Water is needed. In addition, it allows for optional priority of the domestic hot water over heating. Optional, Digital Boiler Signal Converter to 0-10V. 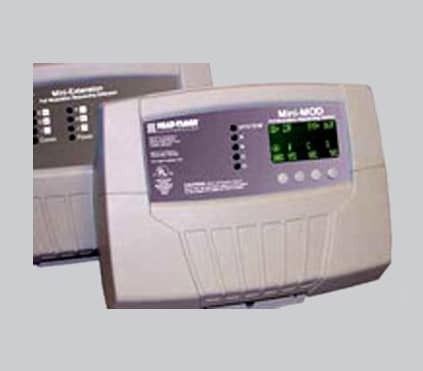 The 0-10V Converter allows modulating boilers with a digital signal to be controlled by the Mini-MOD. It can be purchased separately. A purge timer, a low fire adjustment (Ignition %), a firing point setting (Modulation Start %) for the next stage based on the firing rate of the current stage, a lag stage timer, a last stage hold adjustment, a Soft-Off that holds a stage for a period of time before turning off, and many others. ModelsThe Mini-MOD comes complete with outdoor and system sensors.